Amelia Island, Fla. – It was done in haste. It was to be an alluring delivery system to introduce Jaguar’s brilliant new XK engine intended to power the substantial Jaguar Mk VII luxury sedan. But the Mk VII wasn’t ready, so Jaguar Chief William Lyons and his men created a quick solution. They shaped it on a shortened Mk VII chassis, painted it bronze, named it the “Open Two-Seat Super Sports” and took it to the 1948 Earls Court Motor Show just to show off their new XK engine. Yet the elegant new engine that brimmed with twin-cam competition-bred sophistication played a supporting role when Jaguar’s “Open Two-Seat Super Sports” took to the Earls Court stage and stole the show. This year marks the 70th anniversary of the speed record and the first race victory that set the Jaguar XK120’s course and gave it its immortal name. On a super highway in Belgium the new Jaguar (with full windshield and top erected) recorded a top speed of 126.448 mph. With the windshield and top removed it was timed at 132.6 mph. The XK120 became “the fastest production car in the world” eclipsing the existing record by over 22 mph. Perhaps the XK120’s most impressive number was the price tag: for 1,000 Pounds Sterling one could own the fastest production car in the world. The XK120 had no equal on the road or in the showroom, standing alone atop a short list of aspirational cars. 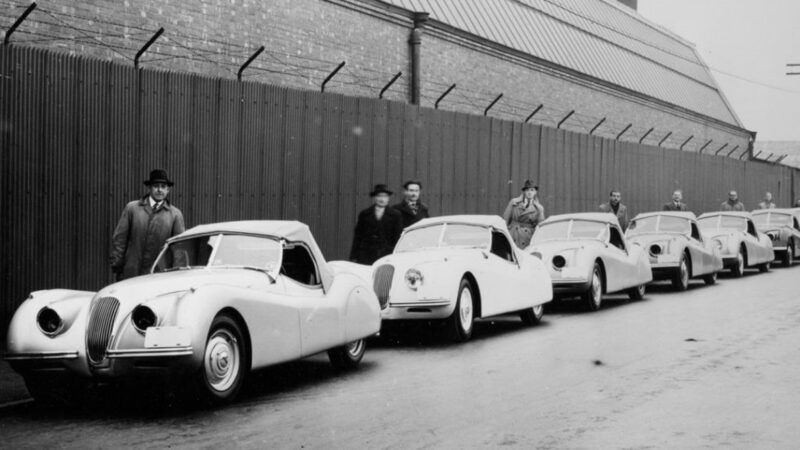 No one was immune to the XK120’s charms. Clark Gable got the first one to arrive in the United States. 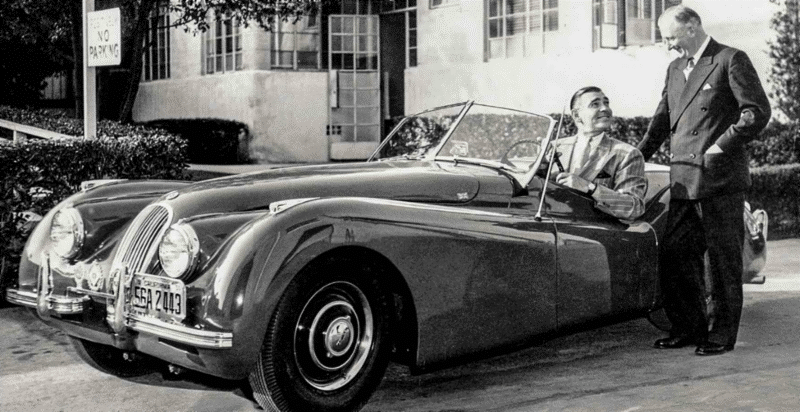 Then Gable had the legendary George Barris customize his second XK120 so he could drive in greater comfort. The XK120’s competition record is as eclectic as it is deep. The record-setting XK120 was converted to right-hand drive. The car then raced to the type’s first victory, winning the Silverstone One-Hour Production Car Race. Future World Champion Phil Hill won the first Pebble Beach Cup with an XK120 in 1950. Jaguar XK-power won the 24 Hours of Le Mans five times in seven years from 1951 through 1957. In 1954, Al Keller’s XK120 coupe won the NASCAR road race at the Linden, NJ airport! It took six months of networking three years ago before David Porter found a 1958 Jaguar XK-150 that hadn’t rusted into oblivion or suffered engine problems. Porter, a retired financier who lives in Darien, said he bought the car from a United Kingdom-based dealer who found the well-preserved specimen under a tarp in an Illinois garage where it had been parked for more than 40 years. Porter estimated about only a quarter of the roughly 820 XK-150’s created remain, and many are in poor mechanical condition, he said. Porter, 63, spent the better part of two days last week getting the Jaguar ready to roll for at the upcoming 10th Annual Darien Collector’s Father’s Day Car Show, which will be from 10 a.m. to 3 p.m. at Lockwood-Mathews Mansion in Norwalk, on Father’s Day, Sunday, June 21. The registration fees for the cars on display will go toward establishing a New England Auto Museum in Norwalk. The car show was previously held at Tilley Pond Park in Darien, which the show has outgrown, said Darien resident Nicholas Ord, a principal board member of the New England Auto Museum effort. “(The show) is getting bigger and there is a lot more opportunity to make the show bigger in Lockwood Mathews, plus we’re establishing more of a presence in Norwalk,” Ord said. While also a professional racer of vintage cars, Porter said car shows offer the fulfillment of being able to share a bit of beauty and industrial history. Certain aspects of getting the car looking its best are tedious, such as polishing the 60 chrome spokes on each of the Jaguar’s tires, Porter said. But sharing the car in its restored glory gives Porter a sense he is fostering a historical appreciation for automotive history. Ord said last week about 40 to 50 owners had registered cars for the show, a number that could jump significantly in the days leading to the show. The non-profit effort launched in 2008 to establish a New England automobile museum is gaining momentum, Ord said, with the group fundraising for a $65,000 market study on whether a Norwalk museum celebrating Connecticut’s role in automotive history is feasible. Last week the group received a grant for $13,000 from the City of Norwalk toward the study, and Ord said the group is focusing on building the future museum at 24 Belden Ave., the former site of the Norwalk Mall. The New England Auto Museum would including rotating exhibits with up to 100 automobiles, historical displays about Connecticut’s history in the automotive industry, and an automotive technology academy in conjunction with Norwalk Community College and the Norwalk Public Schools. “We’ve been looking in Norwalk now for almost three years and it is our favored location,” Ord said. In most years, Porter will show the Jaguar at half dozen or more events throughout the region, including at the Lime Rock Raceway in Lakeville. Last year, Porter raced in the Classic 24 Daytona race, which runs a full day pitting cars with a racing history from eras as far back as the 1960s against each other in a test of automotive endurance. Porter spent part of the race behind the wheel of a 2005 Pescarolo Judd, racing against other cars from the last decade. The Pescarolo finished fourth in the race overall, after bouncing back from an accident early in the race, Porter said. “It was an amazing feeling being underneath the lights at Daytona at 4:30 a.m. in the morning,” Porter said. Admission to the show will be free for visitors, but a donation to the New England Auto Museum is requested. Anyone interested in showing a car can pre-register online at with the fee being $10 per car. More details about the show at www.neautomuseum.org.